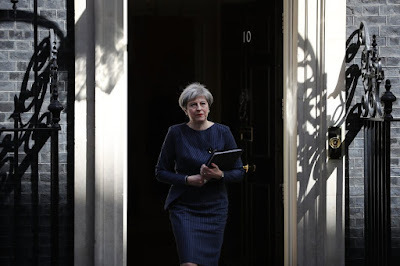 Today’s post could only have been concerned with one news story and that is the news that Theresa May, the British Prime Minister, has called for a General Election to be held on June 8th. For this post, as always, the focus will be looking at the longer vision. We have already looked at the options and the future facing Theresa May in light of the British electorate’s decision last year, particularly with reference to the business arena that may result, and today’s announcement contributes to this future, but in a way that may not be so obvious at first glance. In a slight departure to usual practice, today’s post will start by looking at the politics of the decision, but will then assess the trajectory of recent events in relation to what it means for the relationship between society and big business. To begin with, it is being taken as read that the Conservative Government will have its wish of initiating a general election granted, because first the House of Commons must agree to the wavering of the restrictions imposed by the Fixed Term Parliaments Act 2011, which sought to enforce a 5-year term for any Parliament; Labour Leader Jeremy Corbyn and Liberal Democrat Leader Tim Farron’s almost immediate announcements that they will be embracing the challenge seems to provide the early indication that the Government will waive the restrictions imposed by the Act in the morning. Once the election path begins, officially, there is likely to be an awful lot of accusations, claims, and counter-claims that the British public will have to be subjected to in what is a third major election in three years – following the General Election two years ago, and the E.U. membership referendum last summer. As for the election itself, the outcome is likely to be relatively straightforward – ignoring the general failings of polling companies in the past few years – as the Conservatives hold an incredibly large lead over the Labour party at the time of writing, something which Scottish National Party leader and First Minister of Scotland Nicola Sturgeon suggested was indicative of the ‘selfish, narrow, party political interests’ that she believes embody the May Premiership. Whilst the debate will no doubt run and run over the next seven weeks – mostly about Brexit but hopefully about the state of the NHS, Job Security, and Public Spending, to name but a few extremely important issues that were rarely mentioned today – Theresa May’s speech on the steps of Number 10 Downing Street presented a much more important and menacing political issue. Theresa May opted to take a particularly odd tone in her speech. The tone was set when she began by triumphantly announcing that ‘despite predictions of immediate financial and economic danger since the referendum we have seen consumer confidence remain high, record numbers of jobs and economic growth that has exceeded all expectations’, a viewpoint that is particularly worrying when the real fear is that the decision to leave the E.U. will have lasting effects, and arguably surviving the first year since the referendum should be no cause for celebration. In reality, GDP increased by 0.1%, the Office for National Statistics cut its growth forecast by 0.2% to 1.8%, business investment rates reduced, the Pound has dropped significantly in value, and the interest rates have been forcibly reduced to a record-low of 0.25%; the situation is not as dire as some had predicted, but the economic situation is not to be celebrated. Yet, the really significant section of May’s speech came when she discussed the state of Westminster. The Prime Minister was unrepentant in her criticism of U.K. politics, stating that her approach ‘is in the national interest’ (something which she forcibly repeated), but that ‘other political parties oppose it’ and that ‘at this moment of enormous national significance there should be unity here in Westminster, but instead there is division. The country is coming together, but Westminster is not’. However, opposition has to be the cornerstone of any democracy and the section speech reminds one of the claims put forward by soon-to-be Turkish President Recep Erdoĝan in the run up to the recent constitutional referendum in Turkey, a move which many British MPs who will support Theresa May tomorrow were quick to denounce as undemocratic. The incredible development of this rhetoric is, however, symptomatic of a larger issue. This talk of division and uncertainty is supposed to garner unity to serve the ‘national interest’, but in actual fact it will do the exact opposite. One of the first posts in Financial Regulation Matters discussed the delicate situation facing Theresa May post-referendum, and rather than navigate the choppy waters with delicacy she has, as one onlooker stated, thrown a ‘huge cluster grenade of political risk, uncertainty, and potential volatility’ into a situation that required the very opposite. Her consistent declarations that she would not call for snap election, as it would cause ‘instability’ have now been proven to be untrue. So, what does this mean for society in its seemingly constant battle against big business? One thing that it certainly does is give the upper hand, even more than usual, to big business that is, almost on a daily basis, threatening to leave the U.K. post-Brexit if it is not given preferential treatment as we have already discussed in a previous post. This morning’s development contributed to that uncertainty and division in a way which was actually damaging to the ‘national interest’ because, if we look through a longer lens, we will see that the U.K. is in real danger of having to bow to big business, which very rarely ends well. It is important not to get lost in focusing upon one’s political outlook and short-term issues, because even though this post has chosen to criticise the Conservatives, it is also the case that the main opposition, the Labour Party, are a shambles and offer no real opposition at all – hence May gambling on securing her mandate in the face of such weak opposition. The question is not how will the U.K. government navigate Brexit, but should actually be what state will the country be in 10 or 20 years’ time. It has been mentioned in this blog on a number of occasions that what is required is a conscious and consistent effort to restrain big business so that society is not regarded as some sort of piñata that can endlessly be beaten – today there was not even an inkling that this was on the minds of the leaders of the political parties in the U.K. Instead, we saw continuous back-biting, infighting, and political slurs that all sought to draw attention away from the fact that the poor and vulnerable in this country have had their positions attacked, continuously, whilst the futures of big business is being prioritised by the political leaders. The focus on Brexit and political divisions in interviews today, and not on financial exclusion, an increase in societal deprivation including mental health, physical illness, and suicide rates, increasing inequality, and a sharp reduction in spending on fundamental values in this country like the National Health Service was disheartening – yes, it was paid lip service, but it is not enough. What we need now is unity, but not in terms of all following one party’s vision, but in uniting against real issues that are a blight on our society; it is worth asking ourselves if we believe that today’s events, and the future it created, aided or hampered that aim.